* Menu spacing while no button is "active"
I then logged into chrome and it just had an issue similar to the firefox one/with the text bleeding down when you hover over the links. I can't get a screenshot. I'm on Firefox and when I go into the 'open challenges', I'm seeing Clydesdale Horse's name show up in the mouseover text for someone else's character. hahaha thats not Lilyfeather at all! When Herz/Hirn/Egon applied for an open challenged, it made my little alarm bell orange saying "You have 1 challenge" which is a little odd cause it can be confusing and seem like the challenge is specifically for YOU and not just an open challenge. Also I cannot get the alert to go away- it stays orange and active no matter if I accept the challenge or click it and ignore the challenge. 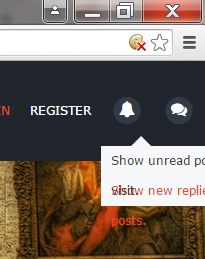 Is it possible to make the latest topics bar appear at the bottom of every page in the forum? It's a little annoying to have to go back to the front page every time to see what has a new reply. Also, quote-button still doesn't work for me. I use Firefox with ABP and Greasemonkey (no scripts for this site) if that helps. The font/spacing/style of the top bar links are different in the front page and sub pages. EDIT: the right padding/margin is different. Hi. The Captcha on the registration screen seems to be broken. An artist on another forum I frequent is trying to join here, but there isn't any obvious way to rotate the images to put them in proper orientation. I logged out and tried myself, using Firefox on Linux Mint. 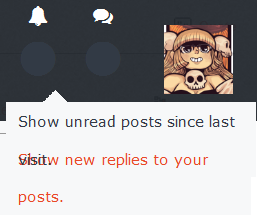 It looks like one static image of the same picture in different degrees of rotation (almost like an animation sprite spread out left to right) that does not respond to clicks, and there are no control buttons. This should be fixed, though I didn't get a chance to verify. Please let me know if you still see issues. Tags, in my opinion, never worked that well to begin with. For the moment, I don't care that they're more broken than they used to be - I'll be overhauling the entire system soon. What I may do is disable the feature for now so people don't frustrate themselves. Registration works now, although the rotate the picture captcha is gone in case that's not what you intended. There is only the type the letters captcha now. "Insert Quote" in the Topic Summary while replying? That hasn't worked for me in a long time, though I've never looked into it. Adding to the list. That was mildly annoying me while developing the current skin. Not entirely sure what to do about it, though. I'll see what I can do, but may have to live with it for a while. I don't doubt this is real, but I can't recreate it. Someone please let me know the next time this happens. News collapses fine, but when you collapse Comics to Vote On, it also collapses News. My notifications circle is red and active, but there seems to be no new messages. This should be fixed now. It was lit up for Staff to post a comic, but without a Staff check, it was lighting up for everyone. I'm trying to update some pages on an intro comic. I've uploaded them like 3 times and they won't change to the new ones. Help!